It will be a different summer for judoka Danny Berthiaume. Native of Notre- Dame-du-Portage in a suburb of Rivière-du-Loup, Que., Berthiaume will represent Canada for the first time at the Deaflympics in Samsun, Turkey. He has been doing martial arts since he was 20 years old, but he began to seriously practice judo six years ago and has competed for the past three years. 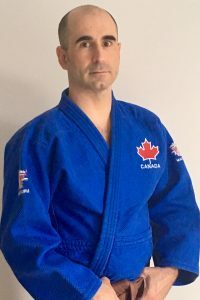 The 39-year-old judoka usually competes in the -73 kg category, but at the Deaflympics he will defend the Maple Leaf colours in the -66 kg category. This affects a part of his training, especially the aspect of nutrition. eral others. He considers all aspects of a fight to be important. “There isn’t anything better than adrenaline during a fight!” said Berthiaume, who works for a small serigraphy company. Until July 18th Berthiaume continues his preparation for the Deaflympics. Follow his results and Team Canada’s by downloading the free Deaflympics 2017 app available on App Store and Google Play.